For the last 6 years FishPal have been working with VisitScotland. 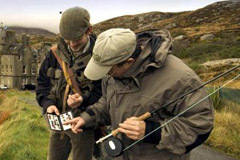 FishPal provide the fishing content for the VisitScotland Portal and are the only providers of external content to this website. UK & International visitors to Scotland are able to read about fishing conditions, river reports, catches on their favourite river, including purchasing their fishing from the award winning FishPal booking facility in 8 languages. The Spirit Of Speyside Whisky Festival reflecting the rich heritage of whisky-making in the region. Visitors can celebrate Scotland’s national drink through an inventive and wide-ranging programme of whisky-inspired events. Anglers visiting the festival can book fishing for the Spey, Findhorn and other rivers close by on the FishPal site. Alternatively contact our customer services team who can advise and book the nearest fishing beat to compliment your stay.